Cool! I've never heard that before 'talking smack'. 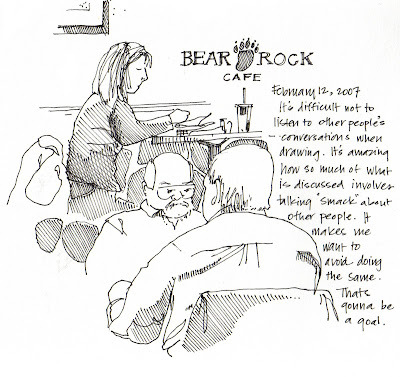 Bear Rock cafe sounds pretty cool too! It's good to see someone drawing who ISN'T in Starbucks! The drawing is great, always great. I think that's a good goal. I just hope not everyone has the same goal; because I just love listening into those conversations! 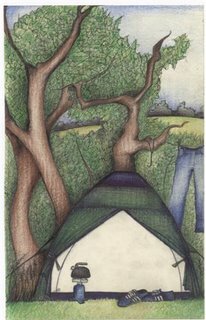 I love the drawing and I know what you mean about the stuff one hears while trying to draw in public places. I went to a zen retreat once for a few days and came away with a resolution not to talk about others at all. It was tough and also amazing to discover how much of what I was about to say was about someone else and I had to not say it. While I didn't keep it up, I have learned not to talk negatively about others since it always seems to backfire when I have.